A Nutritional Ingredient for Livestock consisting of Zinc chelate of amino acids, Manganese chelate of amino acids and Copper chelate of amino acids. 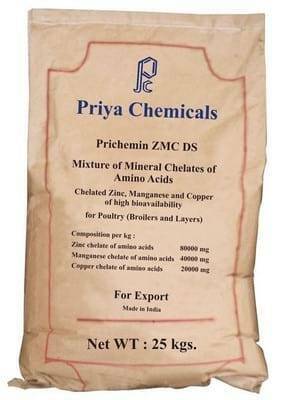 PRICHEMIN ZMC DS is a Mixture of Mineral Chelates. Used as mixture of organic source of Minerals like Zinc, Manganese and Copper in Veterinary. Ingredients : Mixture of Zinc, Manganese and Copper Chelate of Amino Acids derived from hydrolyzed soya protein (NON GMC) obtained by enzymic hydrolysis. 80 ppm Zinc from Zinc Chelate of Amino Acids. 40 ppm Manganese from Manganese Chelate of Amino Acids. 20 ppm Copper from Copper Chelate of Amino Acids. Warning : DO NOT FEED TO SHEEP OR RELATED SPECIES. Shelf life 36 months from the date of manufacture. 2—Larissa, 396/B, Off. S. T. Road, Mahim, Mumbai 400 016. INDIA.